We’re all anxious to get started planting – anything. For those of you buried in snow, waiting for the snow to melt is like watching a pot boil. For others, it’s just a matter of timing. If you can’t wait to get started, why not begin with potatoes? They like cool weather so the earlier you can get started, the better. If you’re going to grow them outdoors check the last freeze date for your area. Soil temperature must be at least 45F. You can often begin as early as February if you have a cool greenhouse. If you don’t have a greenhouse yet and you’re just too impatient to wait, what about starting them indoors? If you have a cool out-of-the-way space that gets good sunlight, you could place a large bag on a flat dolly, fill the bag with about 6 inches of compost, set 3-5 tubers on top with the shoots pointing upwards, then cover with another 4-6 inches of compost. It’s very important to keep the compost moist. Growing indoors means your the planting medium will dry out quickly and often. Don’t over-water as this will cause rot, but keep it moist. I’m not a lover of plastic, but if you use a burlap bag indoors it will dry out too quickly and a wooden container will be too heavy. 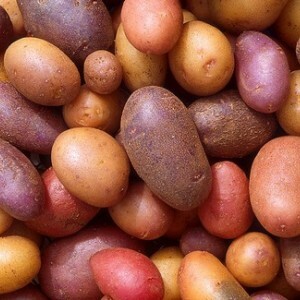 Best to use plastic for now – you can plant your later potatoes in something more eco friendly. After a couple of weeks, the shoots will appear. When they reach 5-6 inches, add another layer of compost so that just the tips are showing. As the shoots continue to grow, keep adding compost to the top of the bag. You’ll be able to move the bag outside as the weather warms. It’s going to be heavy so the larger the wheels on your dolly the better. When you gather the potatoes you are going to use for seed, it’s not a good idea to use those you find in your supermarket. They won’t be disease resistant and who knows what pesticides they contain? You can find proper seed potatoes at your local garden shop. Once they have reached maturity you will have your own potatoes to use for your next rotation. Timed right, you can have potatoes all year round!